Stretch wrap film, commonly made from polyethylene plastic, is a clear packaging film normally used to wrap large or bulk items for transportation or warehousing purposes. ASTM D5458 is a testing standard designed to measure the “cling” between two layers of stretch wrap film. This is a relevant measurement because two or more layers of stretch wrap are usually in contact with each other. For example, stretch wrapped pallets require several layers of film to secure and are usually moved across, or transported on top of, other wrapped pallets. This post is designed to help you understand the test procedure and equipment needed to perform this test with certainty. When you are ready to test products to this standard, please refer to and follow the steps in the official ASTM specification. This test requires a special fixture (shown below). There are two types of samples to prepare. A large piece of film to go on the fixture, and smaller film strips of film that are attached to film clips. Make sure to carefully prepare each specimen as indicated. Clamp the large film sample on the bottom of the incline of the fixture (outside face up). Take a film strip sample (sandwiched between two pieces of paper for easier handling) and carefully press down .5 inches of the strip to the top of the incline. Make sure that the strip is parallel to the gridlines on the fixture. Slide the pieces of paper and apply pressure to the rest of the film strip to create a smooth contact with the large sample. Secure the end of the film strip closest to the bottom of the incline to the film clip. Making sure data is being recorded; begin moving the crosshead upwards (the crosshead is connected to the film clip through a string and pulley). Note the moment when the film strip begins to separate from the “cling line” demarcated on the fixture. The load at this moment is the cling strength of the sample. Cling strength: load at which film begins to separate from the “cling line”. 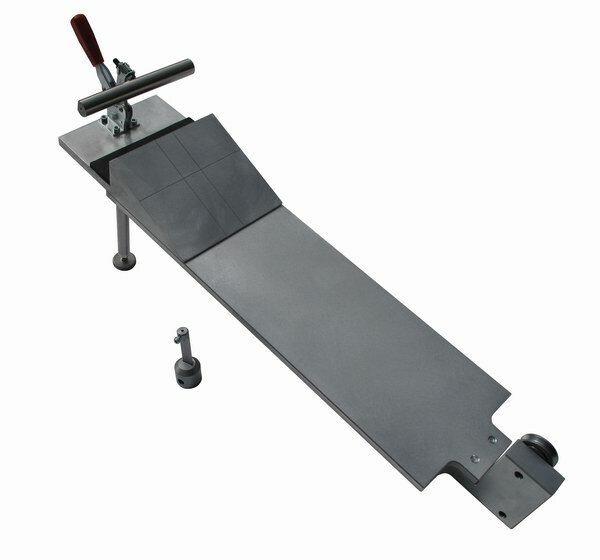 Special ASTM D5458 fixture with incline, steel rod, clip, and pulley. ADMET can provide you with this exact fixture. Tensile testing machine capable of servo control (constant rate of movement) equipped with a 500g load cell. 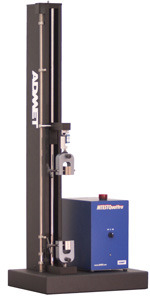 All ADMET testing machines satisfy these requirements. We offer a full line of load cells. A testing controller capable of moving the crosshead at the specified rate and displaying load in real-time. Both MTESTQuattro, our most advanced PC based controller, and the eP2 Digital Controller, a standalone unit, are capable of displaying a load/position curve in real time. Have a question about ASTM D5458 testing?